The 2010 season of Bryson City’s Music in the Mountains gets underway the first Saturday in June with a free concert by Dusk Weaver, a performer whose music has been described as “unique, toe-tapping, thought-provoking fun.” The following week’s concert features Bryson City’s own “The Barn Cats”, pictured above. Each Saturday night, through October, Music in the Mountains brings a different performer to the stage at the Bryson City train depot. 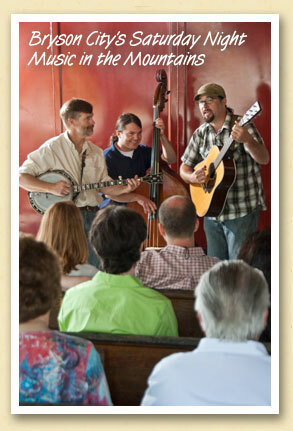 The groups range from old-time country to bluegrass, to jazz, to Celtic music. And Elvis will even make an appearance as the final show in October. The concerts are free and last from 6:30 to 8 pm. You’ll find a complete schedule on the Bryson City area entertainment calendar.